When wanting a healthy, flavorful, fast and easy meal, this grill is the best! This grill works on standard electric, gas or propane stoves. The water-filled outer ring catches fat and juices, which make food healthier, during cooking eliminating smoke and splattering. Benefits of using this indoor grill are many. Food is more flavorful because grilling sears meats and vegetables quickly and locks in flavor. Wine, garlic or other seasonings can be added directly to the water to add subtle flavor. Its also very fast because grilling cuts cooking time significantly! Clean up is simple with the non-stick surface which insures easy clean up! Last but certainly not least this can all be done indoors! All you do is add water, heat, and grill! 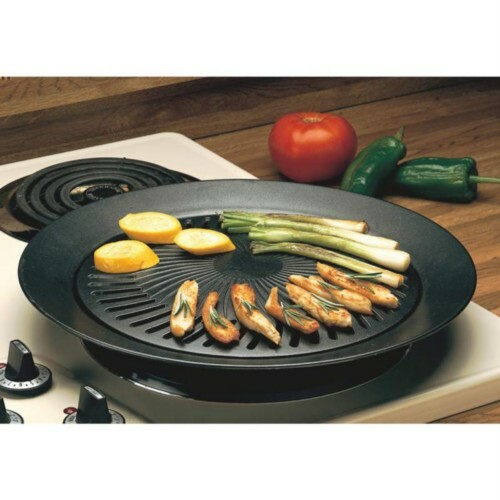 This 13'' smokeless, indoor, stove top grill with iron plate is made by a leading manufacturer of barbecue accessories.